After several stumbles, democracy seems to be advancing in Africa again. Fragile yet taking baby steps ahead. The world needs to encourage this. Despite all the turmoil that Nigeria is facing in its north-east where security forces have been fighting Boko Haram’s rebel forces, and despite an organisational hiccup that led to postponement of the election by a week, the victory in February of incumbent president Muhammudu Buhari was largely fair according to the Nigerian election commission as well as the international observers. In the same week, elections were held in Senegal, one of the most stable democracies in the continent and the incumbent Macky Sall, too, held on to his job with a comfortable margin in the voting, despite allegations that he did not allow principal challengers to contest as they have been convicted of corruption charges. A big and welcome change took place in another large African nation, Democratic Republic of Congo (DRC), which has been in a civil war almost ever since it gained independence from Belgium almost six decades ago. 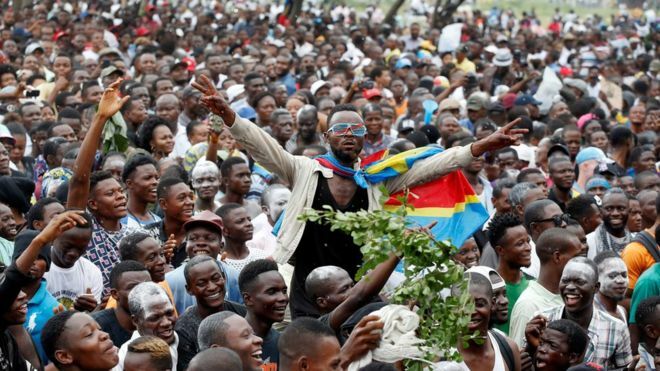 For the first time ever, DRC saw a peaceful change at the top when incumbent president Joseph Kabila stepped down after an election which saw the surprise victory of a little known candidate Felix Tshisekedi over the favourites. Even though the African Union and the European Union have expressed doubts about the outcome, there is a new president in the presidential palace in Kinshasa. In the last couple of years, there have been other peaceful transitions in Africa, notably in South Africa and Zimbabwe, even though there were several doubts whether the all-powerful and well-entrenched incumbents, Jacob Zuma and Robert Mugabe respectively, would ever step down peacefully and of their own accord. There are other similar success stories coming from Africa and several elections are slated for later this year. Democracy does seem to be on a roll like never-before in this heavily conflicted continent. One of the main reasons behind this could be the stepping back of former colonial powers, which have been meddling in the governance of Africa almost like they were before still ruling these nations. Numerous French leaders, including former President Jacques Chirac as well as former Prime Minister Dominique Villepin have been accused on receiving bribes from African leaders in exchange for French support for them, even if they were despotic, had seized power through barrel of a gun or openly indulged in large scale violation of human rights and torture. Similarly, Belgium has never really been able to let go of DRC since its role in assassination of the first democratically elected Prime Minister Patrice Lumumba, soon after his election in 1961. In Libya, it was again French President Nicolas Sarkozy who led a NATO military action to unseat and eventually kill Libyan leader Muammar Gaddhafi in 2011 that led to the resultant civil war that is still on in the oil rich nation. For over a decade now, Sarkozy has been fighting charges of having received millions of euros from Gaddhafi for his campaign in 2006. There have been numerous other examples of French interference in Africa and the countries continue to pay a very heavy price for this. One example is the French guarantee for the CFA Franc, a currency used in 14 central and western African States. The currency is artificially stabilised by the French government and in return, half of the foreign exchange earnings of these nations are deposited in the French treasury and French government nominees sit on the boards of central banks of these countries. Some of the most glaring basket cases of Africa like Central African Republic, Mali, Niger or Chad are part of this group of 14 nations. The French have also been playing kingmakers in various countries, notably their former colonies. World’s largest cocoa producer, Ivory Coast, is a fitting example. At the beginning of this decade, the French were involved in a painful battle, between two leaders in Ivory Coast and that led to the deposition of the then president Laurent Gbagbo in April 2011. Gbagbo, who had ruled for over a decade from the year 2000, was recently acquitted by the International Criminal Court on charges of crimes against humanity in a trial that lasted over eight years. Gbagbo has repeatedly accused the French government of framing him as well as playing a decisive role in removing him from power following a disputed election in 2011. Thus, it is encouraging that now, for once, the international community is playing a rather positive role in assisting the African nations in holding elections and providing observers to ensure free and fair results. This trend must not only continue but also be reinforced. The African states and people need help in building independent institutions and pillars of democracy notably independent judiciary, media as well as election commissions and multi-party democracies. However, democracy will again be tested this year in over a dozen key African nations, notably Egypt, South Africa, Algeria, Tunisia and Mali. The elections in Egypt, Algeria and Mali would be anything but fair or free in view of the prevailing situation. But if they pass of peacefully and successfully in most of the others, it would strengthen democratic institutions across the continent like never before. Then, may be, the common Africans would have a chance to rebuild their lives and their nations. If only external vested interests stopped playing their power games with the poorest and most vulnerable billion of the humanity.